Turns out I was super optimistic about all the things I could get done while recovering from a major surgery, like blogging, or thank you cards. Stephan and I just happily celebrated 1 month of married life while I’ve been on the mend! I’ve decided the best way to talk wedding details is in segments. 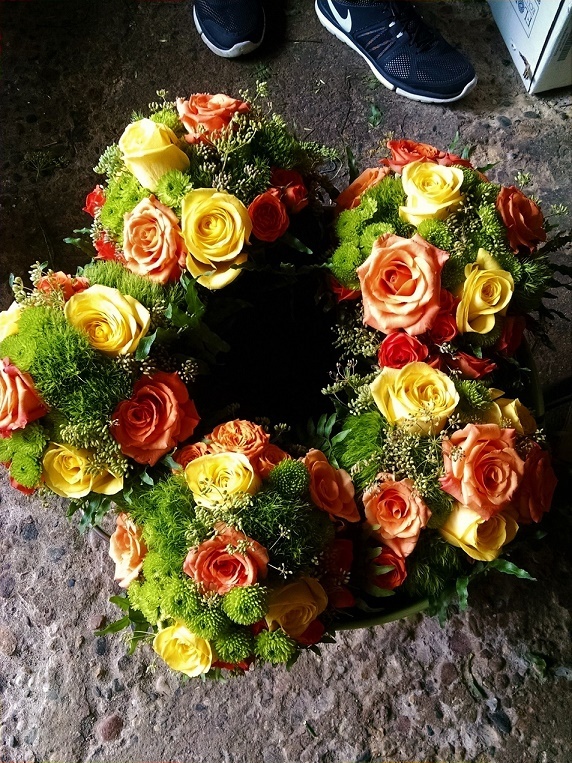 SO, let’s talk one of my faves, wedding flowers! What does a lady do when she’s the one who usually designs the flowers?!? There’s no time to do them all, well maybe I could have squeezed that in magically but there were plenty of other things to do and enjoy like rehearsals, hair and makeup, and time with out of town family and friends, and then the relaxing. 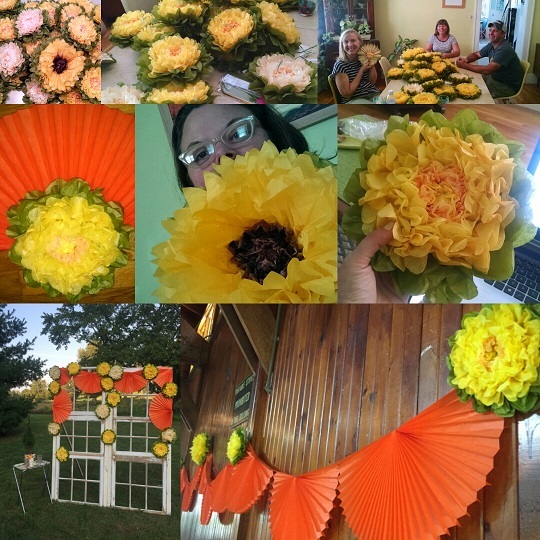 I picked the flowers out, ordered them up, and wrote recipes for the bouquets. Then, my trusty and super amazing friend Michele stepped up and did an outstanding job! We went and picked them up together, spent a little time prepping, and she took the reigns. I knew I was in great hands so it was easy to relax! Besides being an awesome friend, Michele is a talented artist and curator, check some of her work out here and while yer at it, check out the shows she curates at Kendall College of Art and Design if you’re in GR! Thanks to Michele and Cat for capturing a lot of these pics too! Here’s what I did for some simple, colorful, and affordable decor. These tissue paper flowers, I LOVE them! They come in a bunch of different sizes and colors. I had a great time putting them together with part of my wedding party! I also selected orange tissue paper scalloped bunting, I do have a thing for scallops. It was a great way to pack a lot of color and punch to the walls, entrances, and our door backdrop! Detail of our door backdrop. The doors are rentable from Gypsy Soul Antiques. 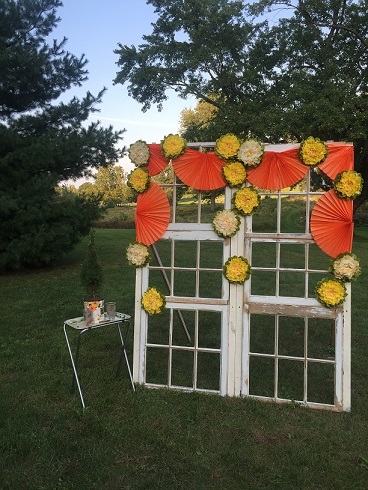 I love the addition of the orange scalloped bunting and the 2 colors of flowers, so pretty! And I love that you can see through the doors to the the park and pathway, a lovely setting. And there’s our little love tree for our unity ceremony. I slip covered the bottom in some vintage fabric, we used vintage glassware to hold the dirt, and it sat atop a little vintage folding tray. The bouquets! Orange, yellow, and green was the theme to repeat the wall decor and pop with the ladies navy dresses. I couldn’t actually get the green eyed yellow roses I really wanted from my wholesaler, but I replaced with yellow roses saving a little loot in the end. 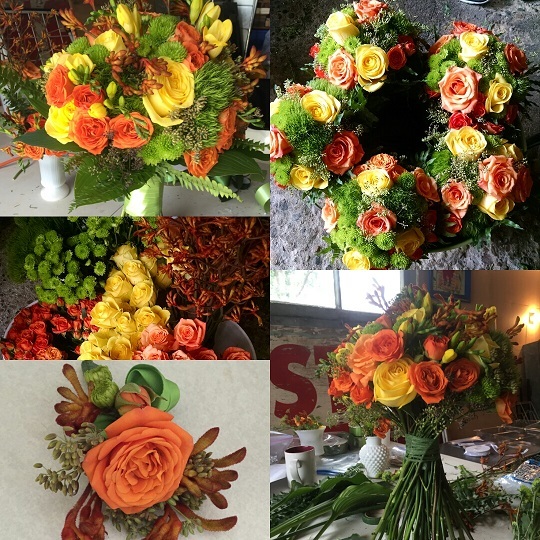 SO, yellow roses, orange roses, orange spray roses, kermit pomps, trick dianthus, ferns leaves, fennel from our yard (another win and money saver) PLUS yellow freesia, kangaroo paw, and hosta leaves for my bouquet and the special boutonnieres and corsages. 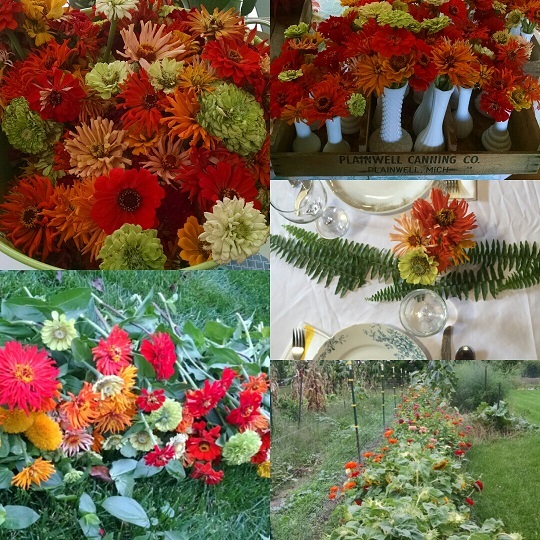 I loved the punch of color the flowers gave and it was a great early fall color combo. Michele’s busy feet taking a rest as we look down on the ladies bouquets. So pretty! 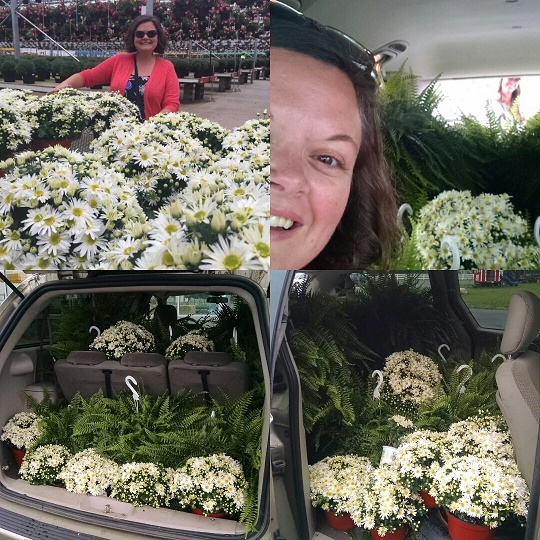 And here’s what it looks like when you put 15 gigantic ferns and 20 mums in a mini van. My best pal Cat and I had some fun in greenhouse land. 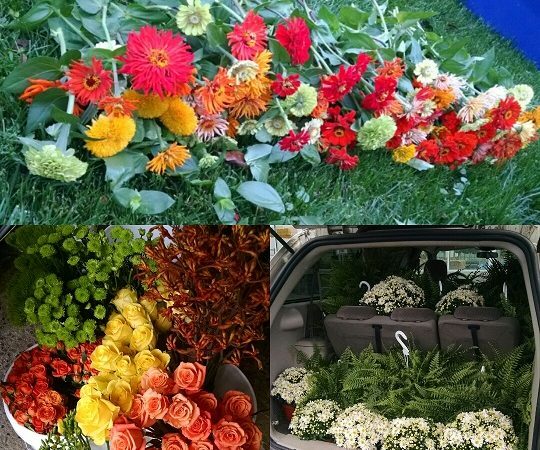 Here’s where the mums went. I used them to perfectly mark the aisle! I loved the little daisy style in white with just a subtle yellow center. 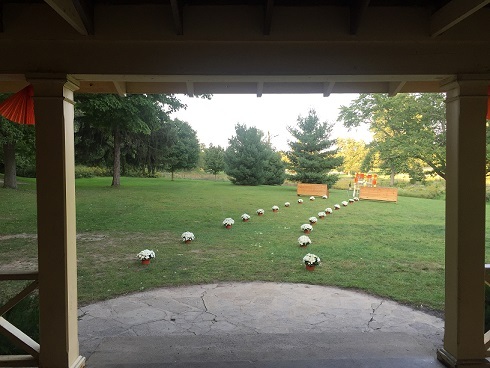 A sweet and perfect path for our early fall wedding. We had a short ceremony so we chose to forgo chair rental and anchored the front with 2 vintage benches for family and special guests. FERNS! I could NOT wait to see this vision in real life! 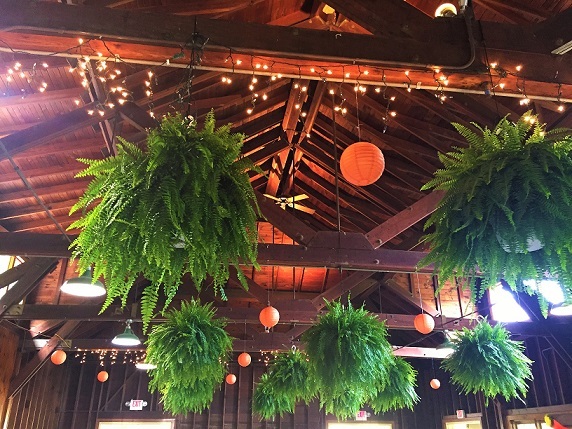 A dozen giant ferns were hung from the beams of the venue. 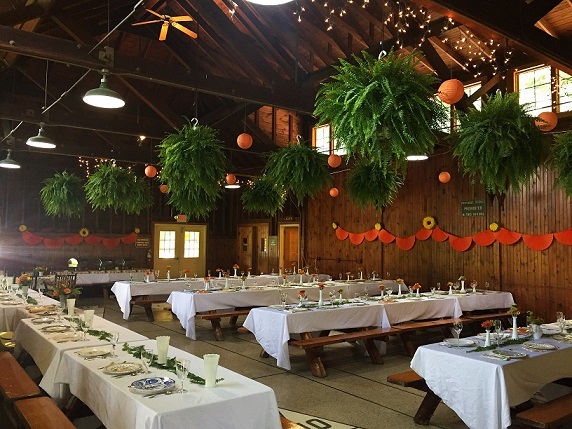 We also used fern leaves as table runners. What a lovely lodge building with giant wrap around porch, beautiful natural park setting, wildflowers, and all the things you need at a crazy good price might I add! Johnson Park is really a great spot! I just love these ferns and what they did to the room, some orange lanterns hung in between, some lights, and voila, magical! AND super thanks to amazing and awesome friends for doing a slam dunk job at setting up our wedding. It was hard to not be a part of the setup as I’m just so used to dreaming up the vision and then physically making or setting it up. I did do plan-o-grams to make it as easy and clear as possible and they really knocked it out of the park! Thank you friends! Another view looking up, so pretty! I just can’t live without color, plants, and green, these FERNS! More on the blog soon- we’ve got more decor, food, details, and the dress to cover still! 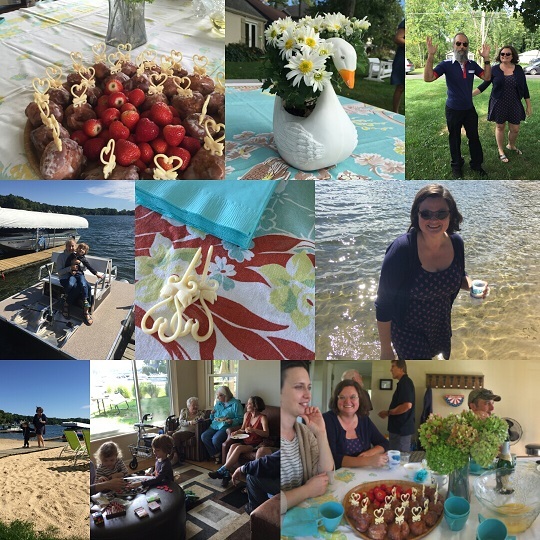 Color of the Month October 2016 and Rehearsal Brunch! It’s mid month and yep, late on the color of the month post. BUT, for good reasons like getting married!!! And for not the best reasons like recovering from surgery. So, this month I give you color of the month in aqua blue along with rehearsal brunch bits too! 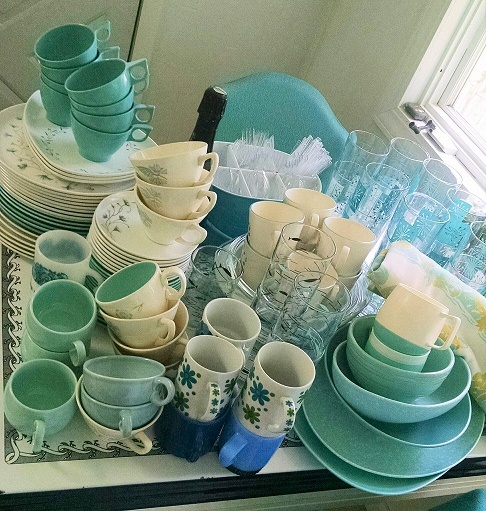 I have been saving up aqua vintage because, well I love it…and I always imagined using it for a wedding shower or party of the sort. SO, when it came down to our rehearsal wedding brunch I knew exactly which direction I was headed! Color of the month, here we go!
! 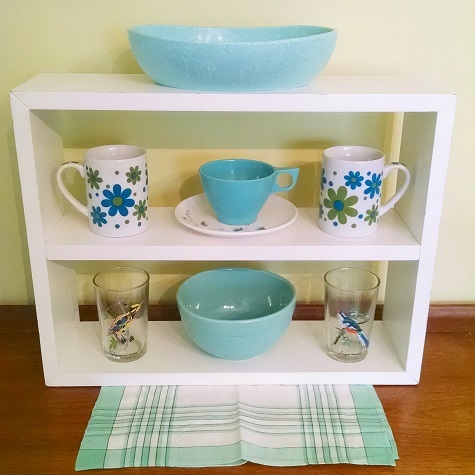 Fave vintage: speckled melmac bowl, flowered mugs, McCoy bowl, bird glasses, melmac cup n saucer, n plaid napkin. 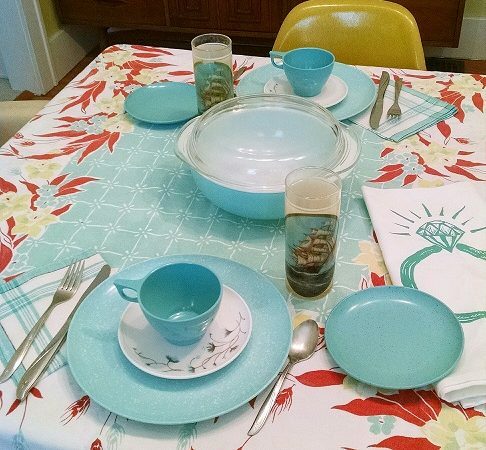 Again using pieces from our aqua vintage wedding rehearsal brunch. 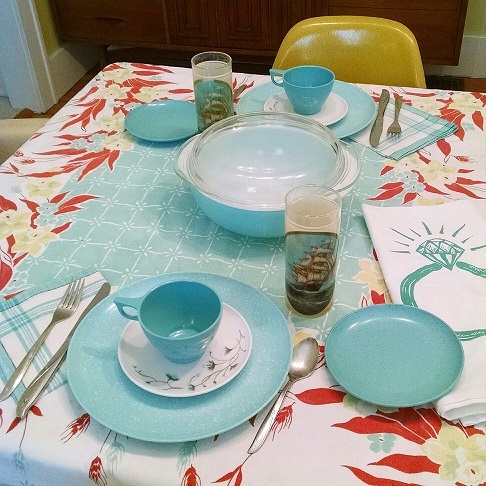 Fave vintage: melmac of course, tablecloth, plaid napkins, Pyrex bowl, artgoodies ring towel, and ship glasses we picked up on our honeymoon. Just a part of my vintage aqua collection. Yep, plenty of melmac plates, cups, glasses, mugs, and serving pieces, add in a few vintage tablecloths and this was no problem at all! This is my grandma’s punch bowl. 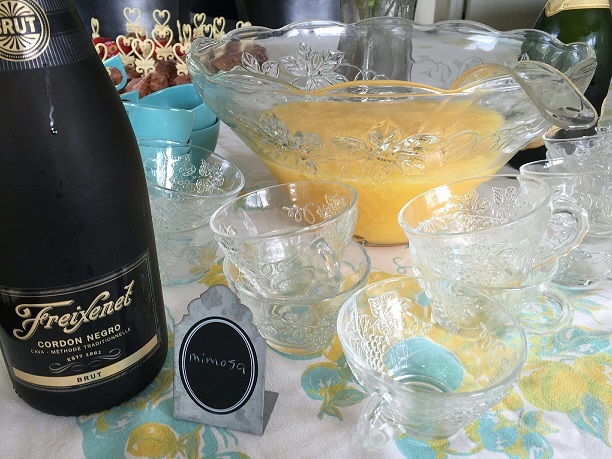 A perfect occasion to break it out and make some mimosas to go along with our late breakfast themed brunch. We also set up crock pots with potatoes, sausages, eggs n spinach, with fruit, coffee, apple fritter holes-homemade from a little place down in Vandalia, MI, they are crazy delicious…Back on track, the punch bowl! Long ago before I was born my grandma gave this to my mom telling her that someday she was going to have a daughter who loved beautiful things and this would be for her. Yep, that would be me and my grandma was a very very wise woman, how I miss her but she was a part of our day in many ways, starting with the celebration here. Oh and I bought these little metal signs awhile back, put chalkboard stickers on them to mark the food items for the day! I used her 40 cup coffee percolator too! My parents rented a beautiful cottage I found on VRBO for the wedding weekend. An awesome way for family near and far to relax together and have some quality time. Stephan and I popped in and out for dinner through the end of the week too. Plus it was a perfect relaxing rehearsal location! 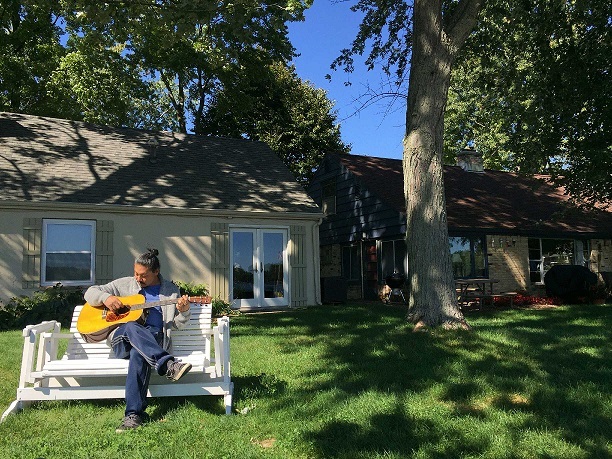 Check the listing out here if you’re looking for a fabulous retreat near Grand Rapids! NOW let’s talk about this awesome guy here! The one and only Danny Godinez! You guys, this friend is an amazing musician! I’ve had the pleasure of seeing him play out in Seattle at several venues, around the house, and here around the lake. He can PLAY, it’s amazing, beautiful, inspiring, exciting, and if you ever get a chance to see him play a show near or far, GO! Plus you can also hire him to play events, weddings, etc, and he travels too. Dude, he’s played with Santana among other famed folks, I don’t know what else to say but Check out his website here! Some shots from the day, there are just so many I could go on and on. I’m still trying to figure out how to blog about all the wedding details too! See those little swan cupcake pics, I bought those years ago and they were just waiting for this occasion! Another vintage swan themed item, a planter holding some cute mums. Friends and family hanging around visiting. It was so amazing to have so many of our faves together, meeting each other for the first time in some instances and seeming to become fast friends. This was SO awesome! There were also kayaks, a sandy beach, paddle boat, omg so nice and so relaxing and we lucked out with beautiful weather for the weekend too! We loved it! What a great way to start off our wedding celebration weekend!